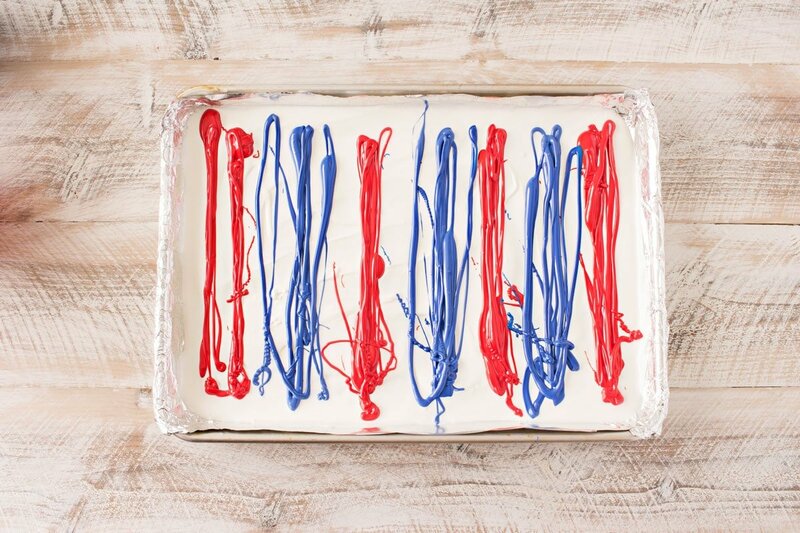 This simple and fun no-bake bark recipe is perfect for Memorial Day or Independence Day! 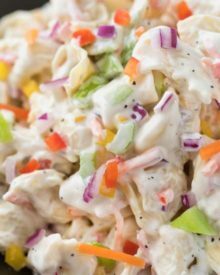 So simple, even your kids can make it! Maaaaaaybe I need to plan my posts out a little bit better… both posts this week are no-bake desserts lol. 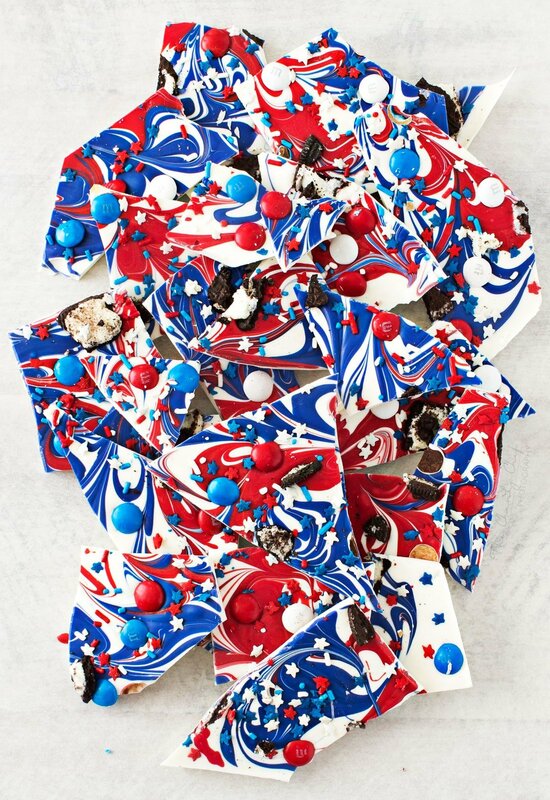 Originally I had planned to share this red white and blue bark with you all next week… but I was too excited, and had to share it early! 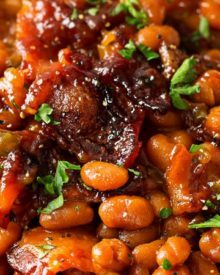 I hesitate to even call this a recipe… it’s seriously SO easy. 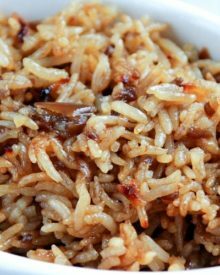 Kids can do this… that one person you know who can’t even boil water… yep, they can make it too! This is totally customize-able too… making something for Halloween? Use orange and black or dark brown. Christmas? Red and green. Perfect!! You can also add anything you want to the bark to “decorate” it. I found these awesome sprinkles on amazon (affiliate link), and just knew I had to have them! Incidentally, if you’re looking for an awesome jelly roll pan that you can use for just about everything… this is the one I have (affiliate), and I LOVE it! Okay, so here’s the breakdown. 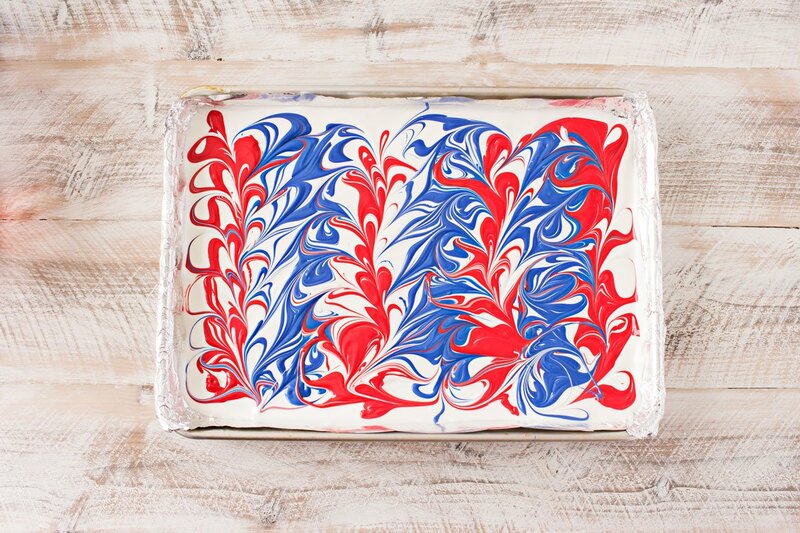 You’re going to want to prepare your jelly roll pan by lining it with foil and very lightly spraying it with oil. Now you’ll need to melt all your chocolate candy melts. 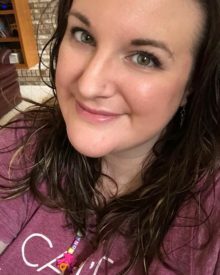 Speaking of those, you can find them at most craft stores, like Jo-Ann Fabrics, or search on amazon. I like to melt my white candy melts in a makeshift double boiler, (since there’s more of the white melts than the colored ones), but microwave the red and blue candy melts. Pour the white candy melts into the jelly roll pan and then drizzle the colored candy melts over the top. Here’s a picture of how I drizzled it for this pattern. Then I used a small wooden skewer (the non-pointy end) to swirl in a figure 8 pattern. Now just top it with your toppings (crushed oreo cookies, m&m’s, star sprinkles, and red white and blue jimmies) and refrigerate until it’s hard enough to break. That’s it!! 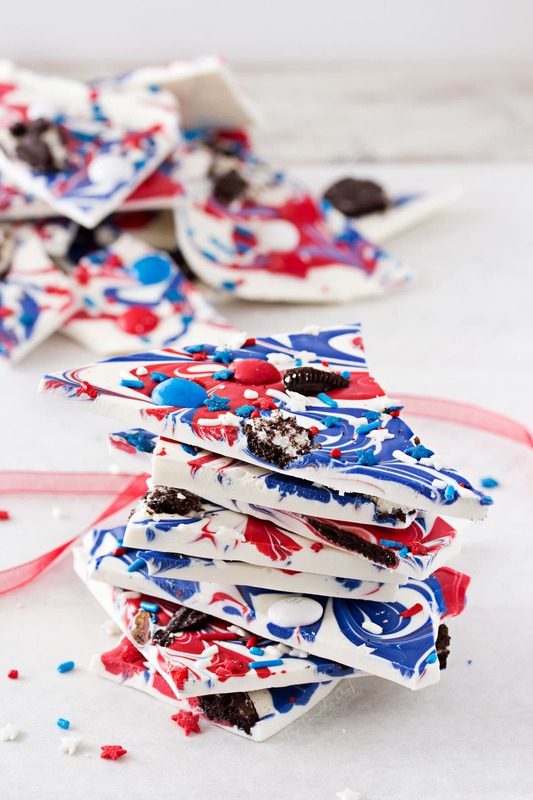 So whether you’re making this bark for a Memorial Day or Independence Day party, giving them away as a gift (SO perfect for that btw!! ), or making them for an afternoon treat for yourself… I know you’ll love it!! Line an 11x15" jelly roll pan (or regular 9x13" pan), with aluminum foil and spray very lightly with cooking spray. Set aside. Alternate drizzling melted red candy melts and blue candy melts in vertical lines over the surface of the melted white candy melts. 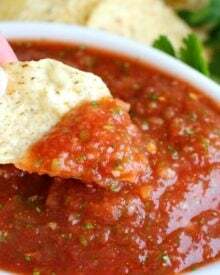 (you could also just spoon bits of red and blue in a non-pattern over the surface as well). Using a small wooden skewer or butter knife, swirl in a figure eight pattern to swirl the red and blue into the white. 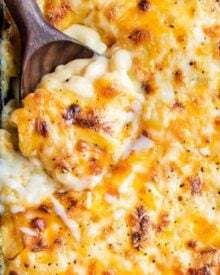 Repeat over the entire pan. You're not looking for a pattern here, just pretty swirls. 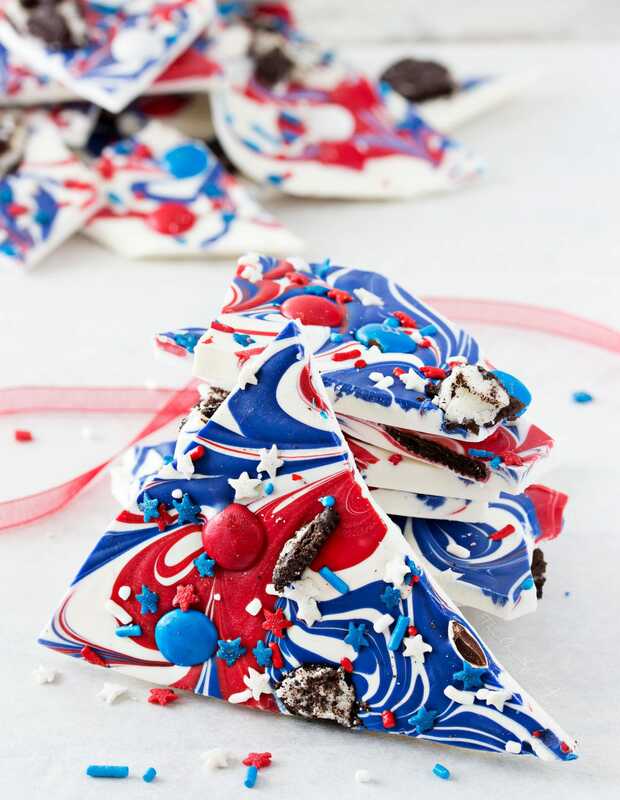 Sprinkle swirled candy melts with oreo pieces, m&m's, star sprinkles and jimmies. looks amazing, thanks for joining my series! Can’t wait to WOW my friends…..but, what is a Jimmie? 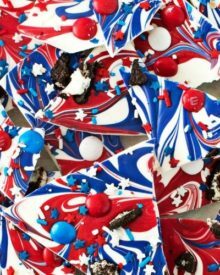 I love this patriotic bark! It’s so vibrant and beautiful! Wow so indicative of the holiday coming up. Such a fun dessert! 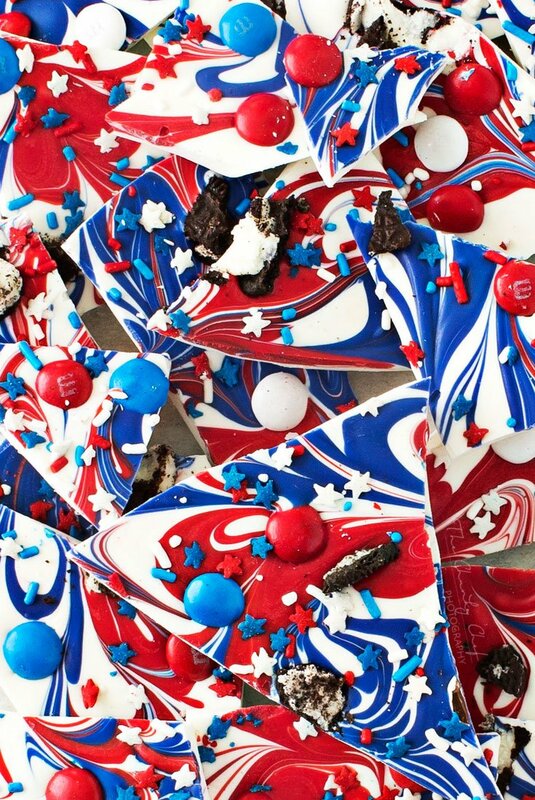 What a perfectly patriotic sweet treat! 🙂 So much fun for Memorial Day or 4th of July weekend! So festive! My kids would love this! This bark is beautiful! I love the color swirls! 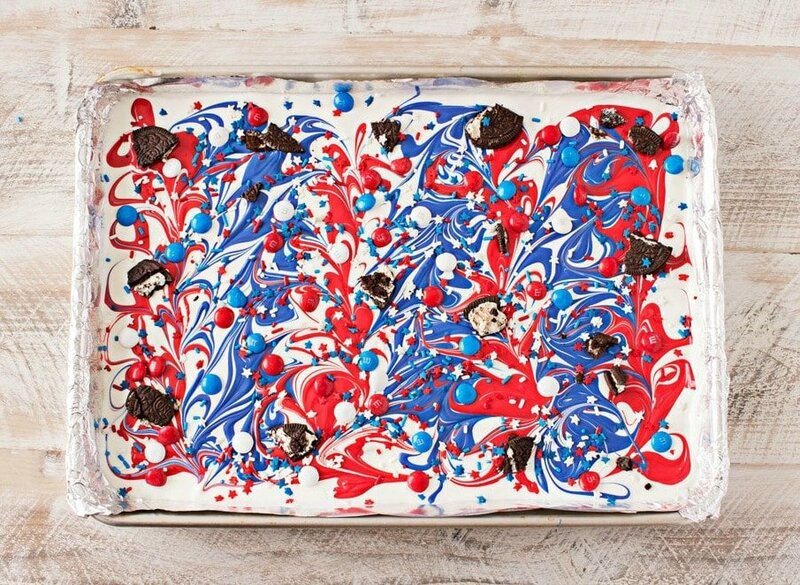 What a STUNNING dessert to make on Memorial Day or July 4! 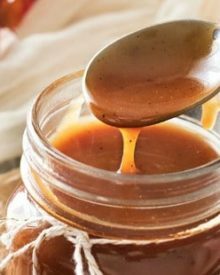 I love when dessert is so simple like this, and I can imagine this would be a blast to make with kids who are just learning their way around the kitchen. Sending this to my cousin, whose kiddos are the right age for this, and I cannot wait to try this! 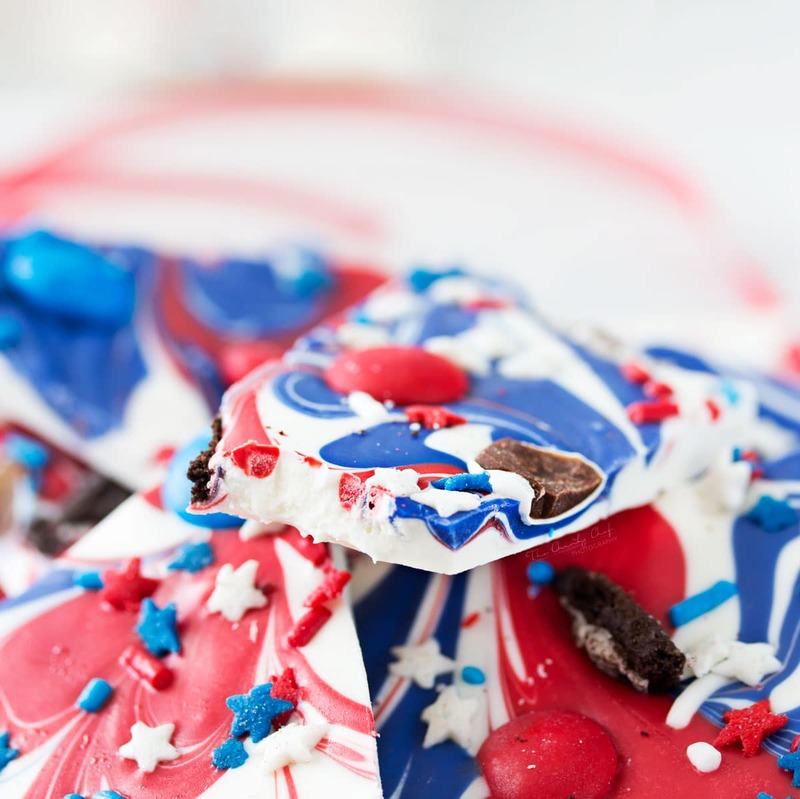 This bark is just perfect for Memorial day! Looks spectacular! This bark is so fun. I’m not sure I have the skills to do the awesome swirls, but it is super fun to look at it and I don’t think I’d have a problem eating the whole batch! This is perfect for the holiday, and it is quite pretty! 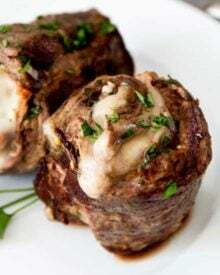 Can’t wait to see my guests gobble it up this weekend.